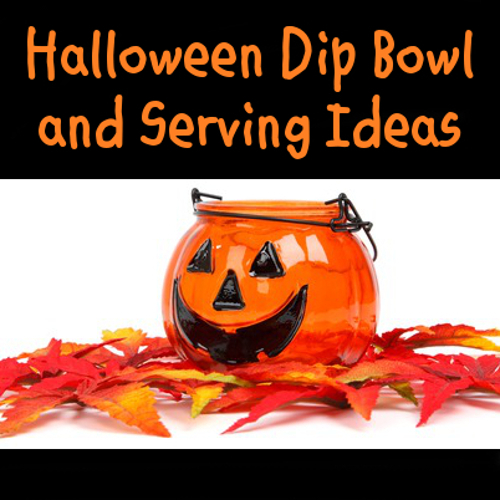 If you're hosting a fun party for Halloween, making up some Fall season or even Thanksgiving themed savory snacks, here's a selection of great ideas for serving dips that work beautifully with this celebration. You'll discover how you can make your own cute miniature style pumpkins that can hold edibles for this occasion as well as being presented with a novelty range of themed containers and bowls. Carving mini faces with your choice of expression into orange fruit makes a fun Halloween craft that adults and older children can enjoy. Come see how to make these mini snack holders which every bit as good as the Jack ‘O’ Lantern style bowls that you can buy online. Enjoy getting your food ready for a fun party or for entertaining this Halloween. 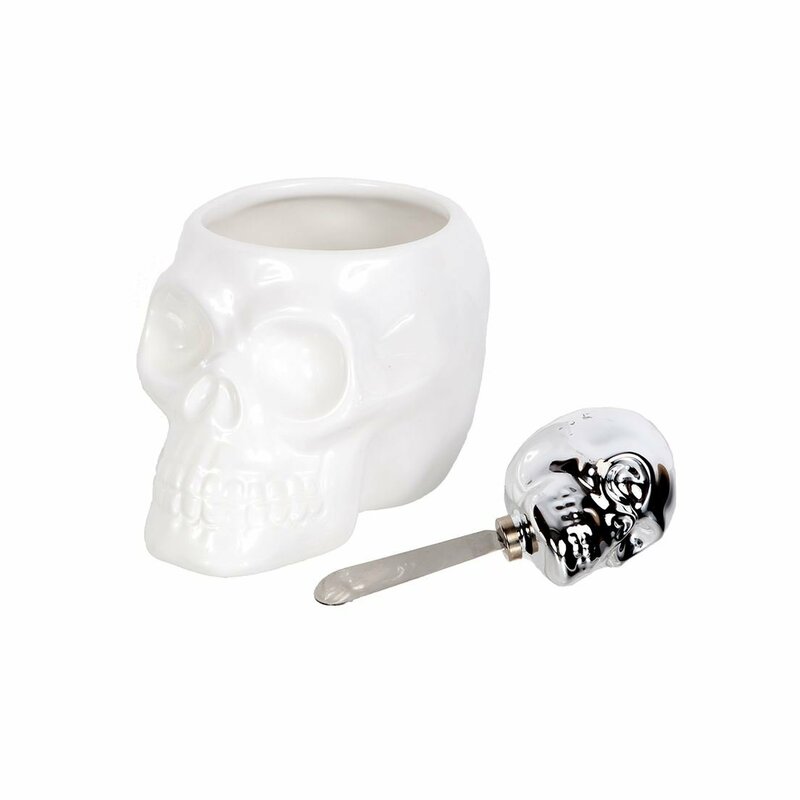 Dips are easy to serve up and can look even better suited for the occasion being in appropriately themed dip bowls. Here's some cool ideas. This is a beautiful looking glossy ceramic soup bowl that comes with a lid. 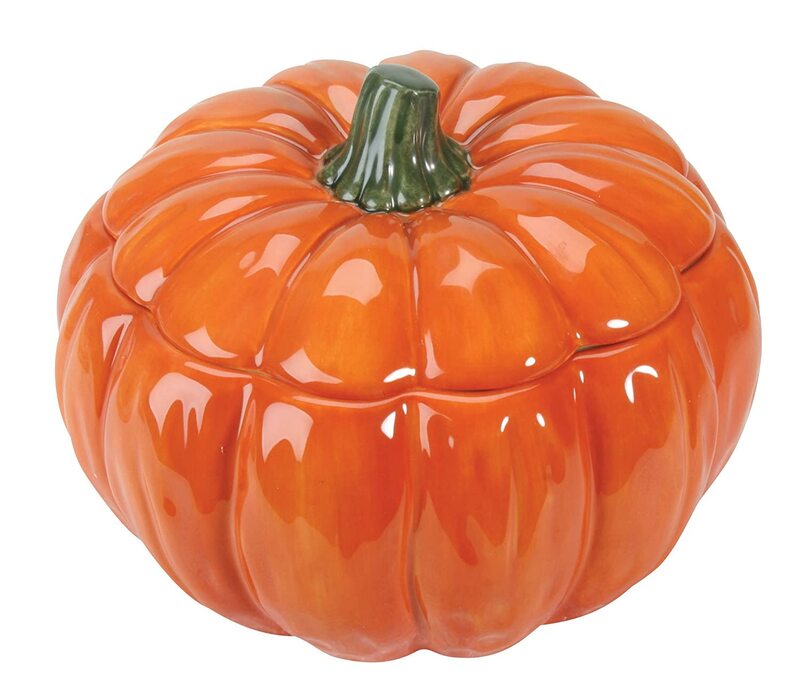 The pumpkin shape is a perfect choice for Halloween, Thanksgiving and Fall decor. I like the fact that you could use this throughout the Fall season and not just for October 31st. It's microwave and dishwasher safe and ideal for both hot and cold foods such as soup, stew, large dip portions, small snacks and candy. 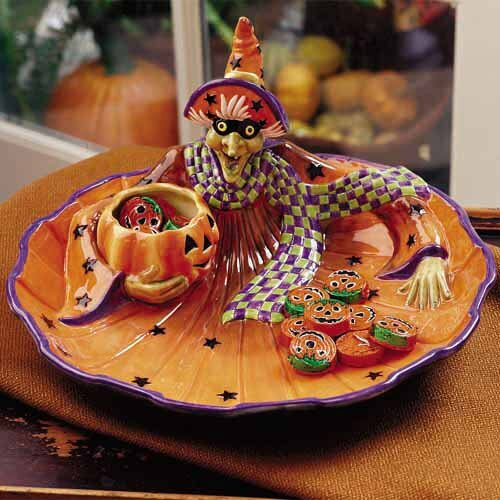 I like the look of this very striking orange and purple Witch theme chip and dip platter with its fun design decorated with stars. 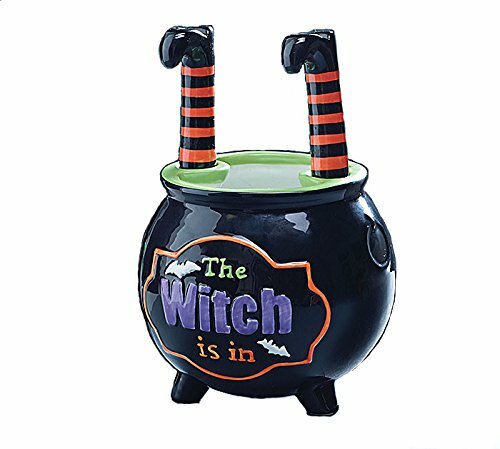 It is ideal for the Fall season as well as Halloween. 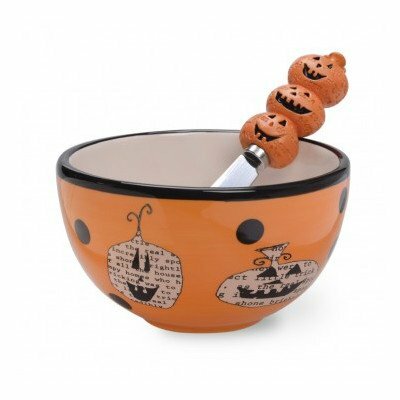 You can use this for other food serving ideas such as chocolates and candy. For more of the novelty factor, how about a really fun take on the Frankenstein monster theme (not pictured) with the monster's mouth holding your choice of dip and a really brilliant spreader knife which looks like a saw. There are loads of fun options to go for. Oranges Make Great Mini Pumpkins! 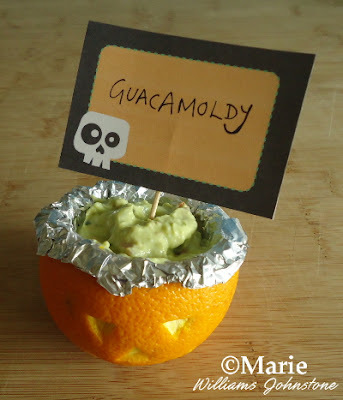 When preparing for last year's Halloween party, I was trying to think up inventive ways in which I could serve my buffet food and especially the dips which were going to be passed around as a starter snack along with the drinks. 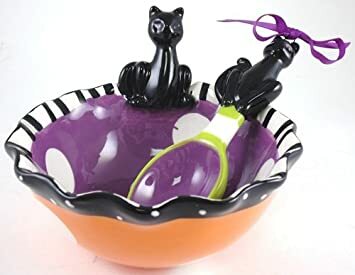 I had some plain dip bowls but these were very dull. What I wanted was some pumpkin style containers to go along with the large pumpkin light that a friend was making for us. The spare oranges on the kitchen counter caught my eye, and I figured with the shape and color that they would make ideal Halloween dip pots if I treated them just like mini pumpkins. So that's what I did. You can see how it turned out and how you can make some with the link above. If children are too young to use a knife or tool for carving, then they can use paints and stickers for decorating these little homemade pots instead. Thanksgiving is another time where a pumpkin theme works well. The color of these oranges make them a cute way to display Thanksgiving food items too. How about surrounding the containers with golden and red leaves and Fall themed table decor.